Walls of flame roared across southeastern Australia, razing scores of homes, forests and farmland in the country's worst wildfire disaster in a quarter century. At least 35 people died and the toll could rise further, police said Sunday. Witnesses described seeing trees exploding and skies raining ash as temperatures hit a record 117 degrees Fahrenheit on Saturday and combined with raging winds to create perfect conditions for uncontrollable blazes. "Hell in all its fury has visited the good people of Victoria in the last 24 hours," Prime Minister Kevin Rudd told reporters as he toured the fire zone. Police said they believed the deaths included groups of people whose charred bodies were found in cars, suggesting families or groups of friends were engulfed in flames as they tried to flee. One official said an entire town had been razed, save for one building, though no deaths were reported there. Police said Sunday they were still trying to confirm details of the deaths and were still trying to get investigative teams into the fire-scarred zone. But Sarah Campbell, a spokeswoman for police in Victoria state where the fires roared, said 35 people were confirmed dead at a dozen locations north and east of the state capital, Melbourne. At least 18 people were hospitalized with burns. The largest of about a dozen big fires in Victoria ripped unchecked across at least 115 square miles (30,000 hectares) of forests, farmland and towns about 60 miles (100 kilometers) north of Melbourne. Marysville, a former goldrush town of about 800 people at the foot of the Dandenong Ranges north of Melbourne, 60 miles (100 kilometers) northeast of Melbourne, was almost completely gone, a local lawmaker said. Media reports said residents fled to a football field to escape the flames. "Marysville  I understand, there's only one building left in the town," said federal parliamentarian Fran Bailey. On Saturday, steel-gray smoke clogged the air and flames roared to two-story heights, while homes and businesses burned. At least one fire truck was charred, though the crew escaped injury and went on to rejoin the fight, officials said. In nearby Wittlesea, organizer Sally Tregae described feeling terror as the fire approached. "I saw trees explode in front of me," she said. "It's a horrible thing, and a horrible thing to see." Victoria's Country Fire Authority deputy chief Greg Esnouf said Saturday's conditions were "off the scale" in terms of danger. In New South Wales state, police detained and questioned a man in connection with a blaze but released him without charge. 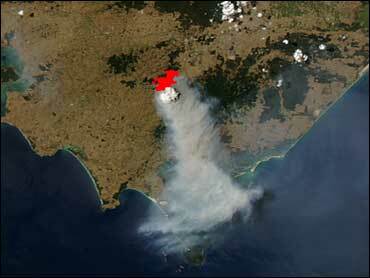 Fires were also burning on Sunday north of Sydney in New South Wales and in South Australia. No properties were immediately being threatened. Wildfires are common during the Australian summer. Government research shows that about half of the 60,000 fires on average each year are deliberately lit or suspicious. Lightning strikes and human activity such as use of machinery near dry brush cause the others.